Markets continued lower on the back of good of a 3rd quarter GDP print that came in at 3.6% and initial jobless claims coming in at 298k. The pullback was still relatively light at it feels like some profit taking after 8 weeks to the upside and most sectors are testing prior breakout areas. Gold and silver did not like the growth accelerating data this morning and therefore sold off into the middle of its recent range causing gold miners to lead the market stocks to the downside. As you might imagine, rates rose on this news to 2.87% on the 10yr as many expect a 3 handle tomorrow if we get a non-farm payrolls number thats exceeds expectations. Retail names were a bit heavy today with some large moves lower in JCP, FIVE, ULTA after hours, and many more. Important to watch this sector for outliers that maintain their relative strength on the back of sector and broader market weakness. That being said, most sectors and major indices look like they want a test of the 50 day EMA before showing oversold signals on the relative strength index and MACD momentum indicators. OIH and PXJ continue to grind out a base and look like they will move higher once the broader market moves higher. I still believe we will get a test of resistance in the mid 16s on the VIX and would not be surprised if we get that tomorrow as it is unclear whether good news or bad news, in terms of economic data, will rally equities at this point. Other than that we saw some nice continuation in individual names that were set up well. The shippers did will today with movement in DRYS, EGLE, DXS and many more in the space while some plays in the natural gas space did well after natural gas futures continued to rip higher up nearly 20 cents on the day. Crude continues to consolidate well below resistance which is why I continue to watch some ENP names and others I mentioned in earlier posts like KOG, DO, OAS. The coal and steel sectors also saw some nice action in the past few days so I would be looking for continuation in names like WLT, X, CLF etc… in addition to the rails that may do well in conjunction with moves in these commodity plays. I am still long KOG Jan 12.5 calls and will look to put on new longs if we do get that test of the mid 16 range on the VIX and possibly test the 50 day on the major indices. Will post some setups in the morning on twitter/stocktwits before the open. Today the broader markets got back into neutral as there is some indecision on both sides as most are hesistant to press positions going into what is a somewhat overly hyped jobs Friday. ADP employment numbers came out at 215k today vs the 184k expected which could signal some continued strength in tomorrow’s initial jobless claims numbers and Friday’s non-farm payroll report. This number has presented some head fakes in the past, but many are still trying to decide whether an improving jobs picture is a buy or sell signal for equities. What we do know is that rates were up on the day and stocks traded in a relatively wide range compared to the limited volatility we’ve experienced over the past week. Either way you look at it, the market is going to decide by Friday whether it will retake the falling 8/13 day EMAs and push higher or if we’ll finally get some real pressure to the downside with a break of the 21 day which is key short term support on many charts. In addition the VIX needs to break down back below support but I think it has room up to the 16.30-16.70 level before it breaks down again back to the low teens. Individual names and sectors did provide great opportunities on the long side today. 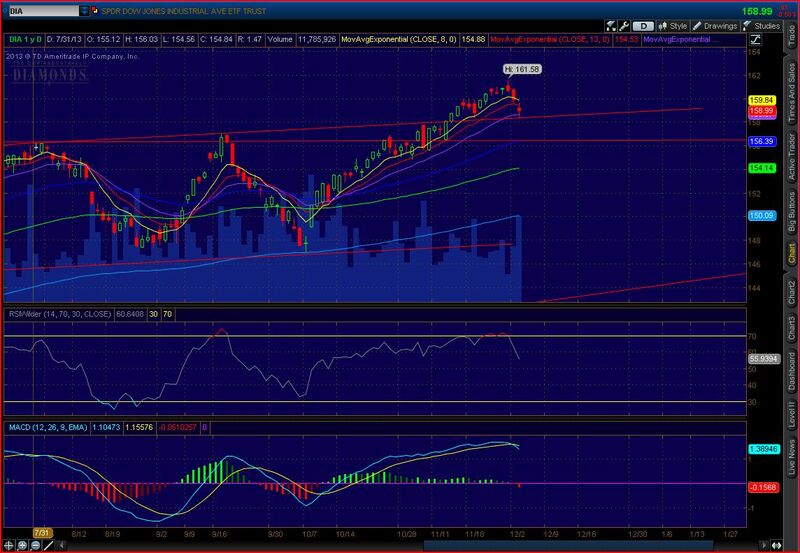 I did take profits in the LVS Jan 72.25 call position at 3.55 for a 50% gain. Still holding 5 KOG Jan 12.5 calls from .25, as the stock broke out today on heavy volume. The rest of the space looks good as well. Some solar names looking to perk up as well, social media names caught a bid and moved higher after showing bullish options activity (fb, twtr) and XRT the retail sector ETF broke trend line support but held the 21 day today after we saw some bearish option activity earlier in the week. If not outright bearish at least signaled some to take risk down in the sector, nonetheless it has moved lower since then. Sorry for the short post, I will try to list some setups tomorrow before the open tomorrow. GL all. Today was day three of the controlled pullback we’ve seen in the broader market. What I found somewhat amusing was the language used by some of commentators on CNBC to describe what they say could be the start of a 3-5% or even 10% correction. Although we did see some complacency in the put/call ratios while being up several weeks in a row, as well as some distribution late in the sessions last week, we are still only 1-1.5% off the highs. Given that December is a seasonally strong period for the market, I don’t see any reasons to be heading for the exits just yet. Most major indices and key sectors have bounced at support intraday and remain above rising 21 day EMAs. Most three day corrections this year have been met by buyers around key levels so although my gut tells me we have room to the downside of 1783 on the S&P 500, I did, indeed, buy the dip. Sectors that have been showing relative strength during this pullback as well as individual names caught a bid and look good as long as the broader market can perk up a bit to provide support. I got long 1 LVS Jan 72.25 call for 2.26 after we saw a huge buyer of this strike with volume doubling the current OI, with some activity spilling over into the 75 and 77.25 strikes. I also bought 5 KOG Jan 12.5 calls for .25 as I think the space is bottoming and this name was able to break through trend line resistance on good volume. Other names in the space to watch include DO, OAS (Which got knocked down to support AH because of a secondary, but may be worth a look tomorrow), DO, WLL. Crude oil breaking out here. Needs to consolidate at these levels before testing the 100/200 day EMAs above, but definitely worth looking into some of the energy names that have been lagging as of late in the ENP space that look to be bottoming. 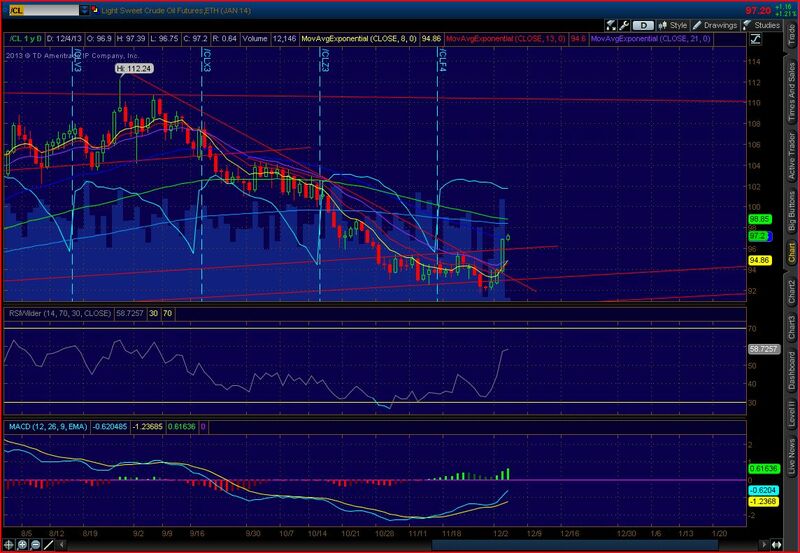 Crude remains a long above the 8/13/21 day EMAs. DIA testing the 21 day EMA and prior breakout level. Harami suggesting a change of trend from lower to neutral/higher. 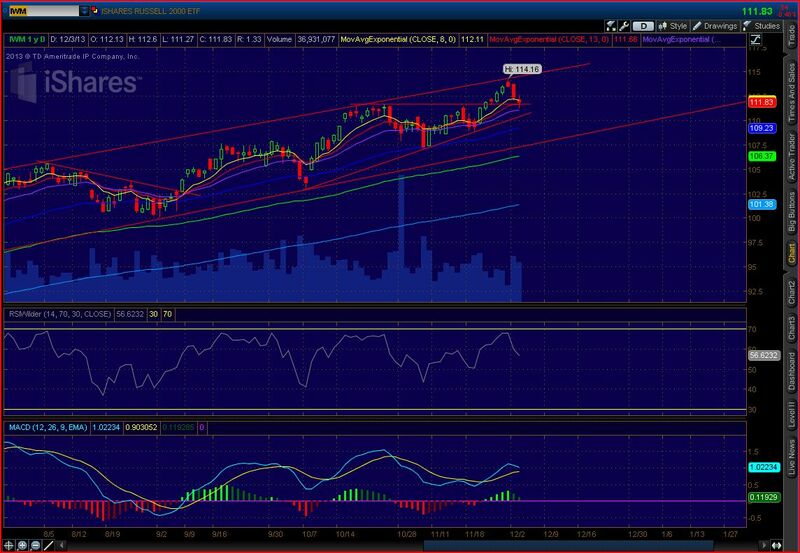 Longs use stops below trend line support. IWM holding the prior breakout area as well and found buyers just above the 21 day EMA. Like I said earlier, three day pullbacks have been bought so looking for a reversal higher in the coming days.